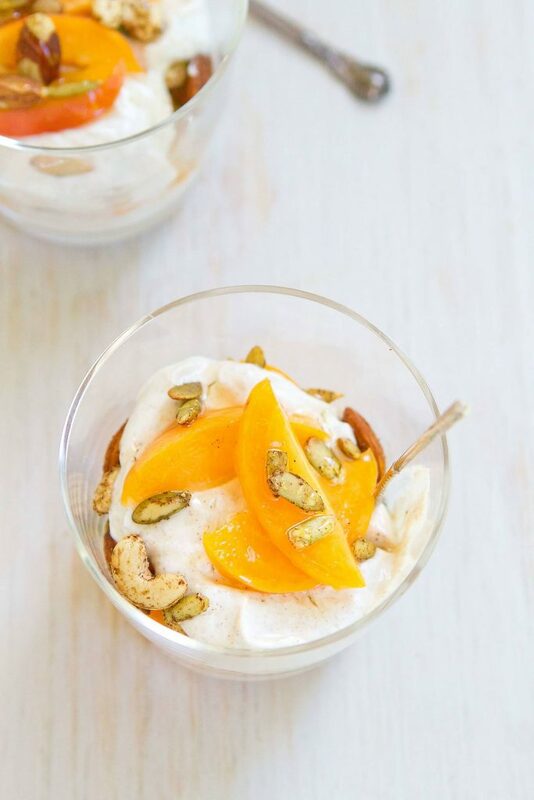 Spice up your morning with these easy, healthy Apricot Chai Yogurt Parfaits. Tons of flavor, protein and fruit, plus the crunch of chai spiced nuts. There was a time when all I ate for breakfast was my favorite go-to yogurt parfait. Every single day. My love for this simple breakfast began when I embarked on my health and weight loss journey. It’s easy to throw together after my morning run and has enough protein to hold me through the morning. For me, protein and healthy fats are key to warding off the constant munchies, which is why I work avocado and olive oil into so many of my meals, and protein into every single one. 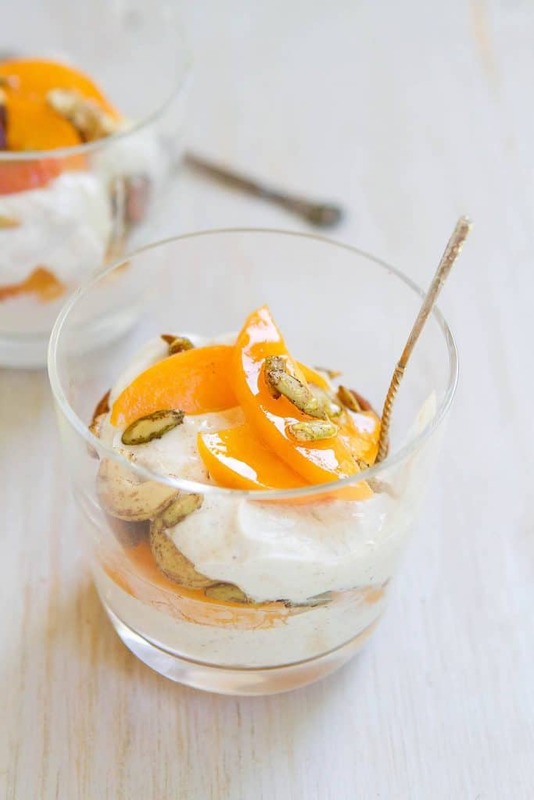 These apricot chai yogurt parfaits provide a good amount of protein – almost 17 grams per serving – from both the nuts and the yogurt, along with healthy fats. 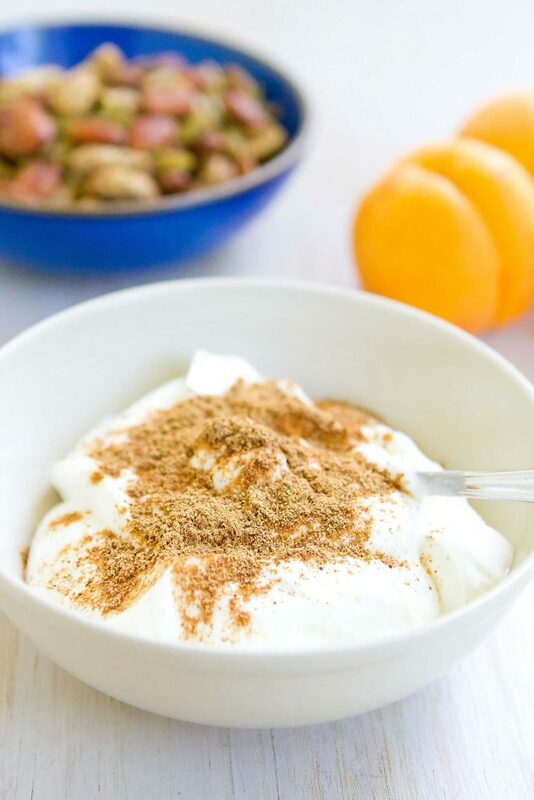 While you could use raw nuts, this yogurt parfait was inspired by my Chai Spiced Nuts, which only take 12 minutes to prepare. Make a batch at the beginning of the week so that you have plenty on hand for snacking and incorporating into chai yogurt parfaits. The chai spice mix used in this recipe is the same as the one from the Chai Spiced Nuts. Whenever I prepare a batch of the nuts, I make a quadruple dose of the spice mix, then transfer it to a glass spice jar to keep on hand for both the nuts and the parfaits. If stored properly – in a cool, dark place – it will last for months. Taste the yogurt as you mix in the chai seasoning. It has a strong flavor, so add to taste. Apricots struck me as the perfect fruit to match with the chai seasonings, but any stone fruit would work well. Think peaches, nectarines, plums. Even mango or dried apricots would be good substitutions. As for the yogurt, nonfat is my personal preference, but feel free to substitute with a higher fat version. There’s definitely something to be said for full fat Greek yogurt! 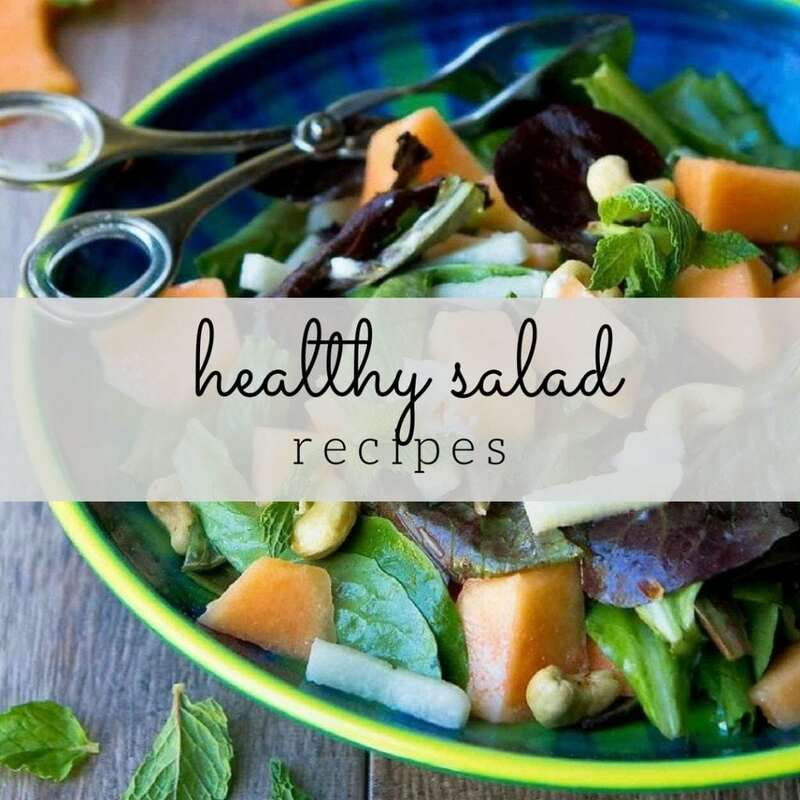 Just be aware that the nutritional information listed in the recipe below will change depending on the ingredients you use. In a small bowl, stir together the yogurt and chai seasoning. 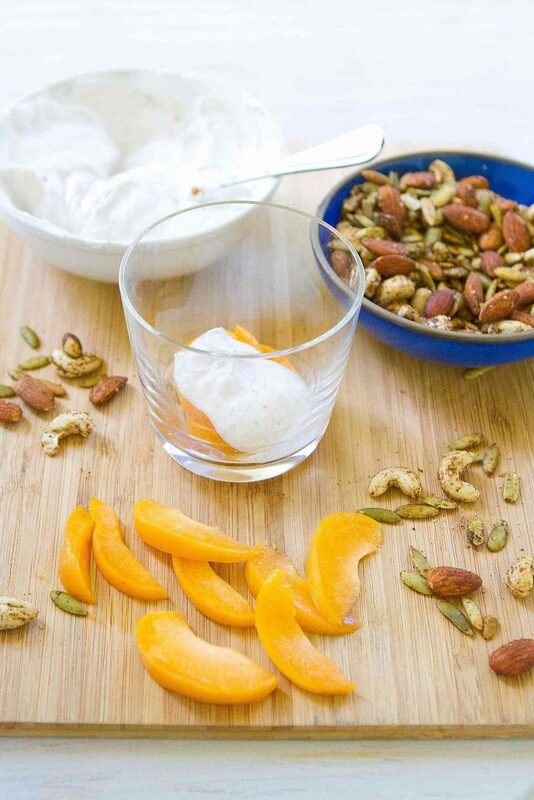 Using two small glasses or bowls, layer the chai yogurt, apricot slices and chai spiced nuts. Drizzle each parfait with 1 teaspoon honey. Serve. Stir together before eating, if you wish. 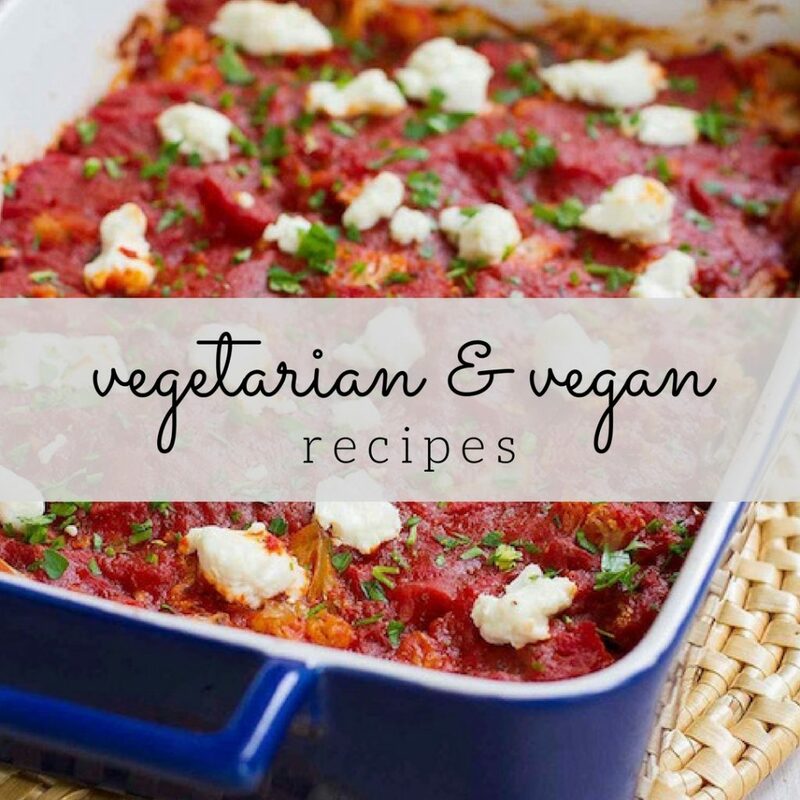 I’m always looking for ways to add protein to my diet and this is perfect. I’m a lover of all things chai too. Can’t wait to try this! I could definitely eat these every day for breakfast! You had me at chai! LOVE the flavors in this parfait! I’m a fan of all things chai! These look delicious. Apricot and chai would be so good together. 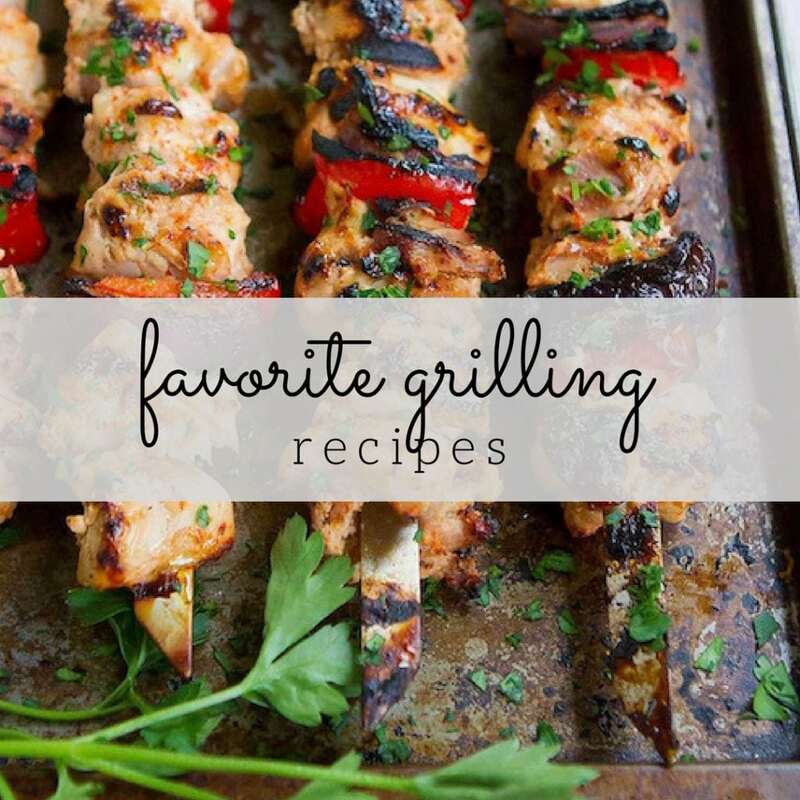 And lots of protein – these are perfect! Totally craving these! So much flavor!